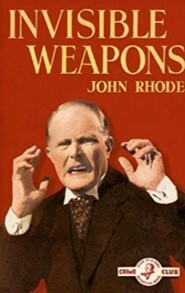 John Rhode’s Invisible Weapons was first published in 1938. Re-reading it today leaves two impressions: first, that I was slow on the uptake. That is because it was only hours after I finished reading this mystery that I realised the title was literal and not metaphorical. And, secondly, because this is another Golden Age mystery that reveals it has a special significance in the twenty-first century. I want also to praise John Rhode for something much more down to earth. Invisible Weapons has at least two murders: the first happens early on when an unexpected visitor arrives at a country house and takes advantage of the facilities to make himself comfortable after his long drive. That is, Uncle Bob has used the downstairs WC and is washing his hands afterwards when the mortal blow is struck. We have all turned the knob that tells the world outside that the lavatory is occupied. There cannot be many other rooms that are so locked, nor have there been many authors who have taken advantage of our bodily functions to set up their murders. The house owner is a doctor who has been out on his Saturday morning rounds, and it is on him that suspicion falls, since he has a financial interest in his wife’s uncle’s death. As in Death at Breakfast, also recently reprinted, Rhode’s policemen, Hanslet and Wagstaff, are interested in little more than pinning the crime on him. In one way, it is fortunate for Doctor Thornborough that the crime is too puzzling for that. In another, as we shall see, it is not. The second half of the book deals with another death, that of Uncle Bob’s London neighbour, and where Rhode dealt with toilets in the first part, in the second he gives us sewer gas. Dr Priestley, Rhode’s great brain, recognises all the connections, but never seems to comment on the knowledge that the murderer must have to utilise all these methods – almost as much as Priestley himself. To return to the country town of Adderminster, though. Dr Thornborough is in a joint practice – he is the younger and more active partner. He clearly expects to work all of Saturday, he is only returning to lunch, something our younger practitioners have abandoned, but he has to pay his way in life. His house (which includes his surgery and waiting room) is a new-build, and he has a new car. He has a mortgage on the house, and the car is being paid for on hire purchase: if he had any capital it has been spent. Both debts would be normal today, but in the social system of 1930s provincial Britain, a doctor who has to borrow money is not really a gentleman. Then, and despite the police finding nothing to use against him, Thornborough finds his patients abandoning him, and by the time of the second death, his income has collapsed and he has had to quit the town and move to London. As with various cases in our own time - implications have ruined an innocent man’s livelihood. Some readers have little care for murder mysteries in two or more parts, and apparently unrelated crimes that ultimately mesh together, and put such books aside. In the case of Invisible Weapons that would be unfortunate as John Rhode has found some interesting aspects of everyday life in his strange and mysterious deaths. And as for the treatment of Doctor Thornborough, I think there are terms for it from the worlds of today’s social media.